Disclaimer: I received a copy of this book in exchange for my review. However, all opinions are my own. This post contains affiliate links. Kids that come to be in their family through adoption, though, are just that – kids. In the same way my biological children are learning who they are and how they fit in their world, adopted children navigate that same path with arguably more hurdles. For those whose skin color doesn’t match those around them, it could be more difficult. Another disclaimer: I still don’t know any of this personally. We are European-descent, very white people. My husband calls polka music the music of his people and said today that his idea of heaven includes sausage on a stick and German beer with that music playing in the background. While I consider myself generally knowledgeable on the subject of adoption, I have zero first-hand experience. I have been fortunate to be close to friends that have grown their families in that amazing way. 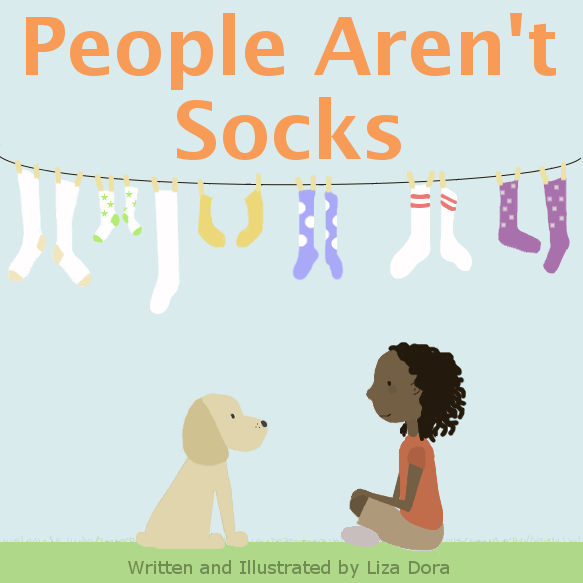 Author Liza Dora tackles this theme in her second children’s book, People Aren’t Socks. Both kids and adults can learn from a young girl named Margo who is trying to figure out her world in which she doesn’t look like her parents. Her “Papi” plays an integral part in guiding her self-discovery. The simple beauty in the illustrations shows the reader what the family looks like. The words walk you through Margo’s perspective of watching her friends at school and their resemblances to their family members and how that makes her feel when she looks at her own family. Bonus: there are discussion questions in the back that could spark needed discussion at home or even used in a classroom setting. Spoiler alert: the title is true. People aren’t socks and they don’t have to “match.” Margo’s Papi reminds her of all the ways that she fits in her family. The tagline is a universal truth: In families, it’s not the looks that matter – it’s the love.